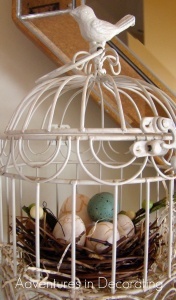 What To Do With An Old Birdcage? 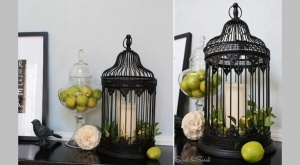 Rhoda at Southern Hospitality Blog has used a birdcage in a way probably no one could think of. 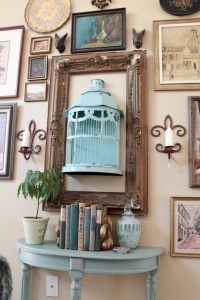 She has used half of a birdcage painted aqua and has framed it to become the part of the gallery wall display in her living room. The Pleated Poppy has a wonderful idea for book worms who have already lined a wall or two with bookcases and still need a storage solution. 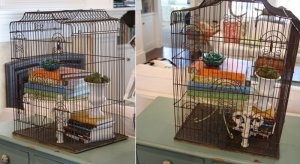 Simply find a big birdcage that has enough space to store at least 10 to 15 books. 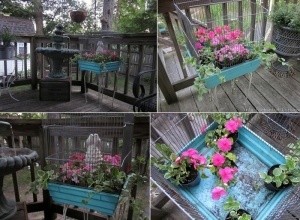 Donna at An Enchanted Cottage has shared a lovely way to upcycle an old birdcage. Let an old birdcage give a home to another life though not a bird but plants still live and grow and will make you happy when you will see them. 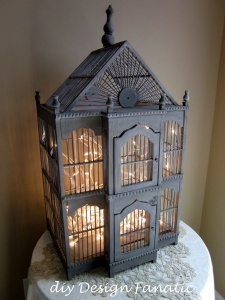 Pam at DIY Design Fanatic has created a whimsical lamp using an old birdcage. She spray painted the birdcage and then added a string of lights to it and the result is in front of you. 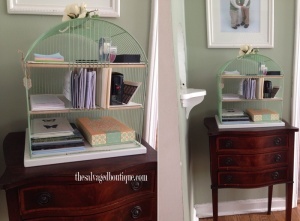 Karen at The Salvaged Boutique found an old birdcage and she knew she had to convert it into a beauteous desk organizer. She painted the birdcage in a wonderful shade of green and then added dowels and plywood boards to become the shelving. Absolutely marvelous work Karen!